Hi friends! 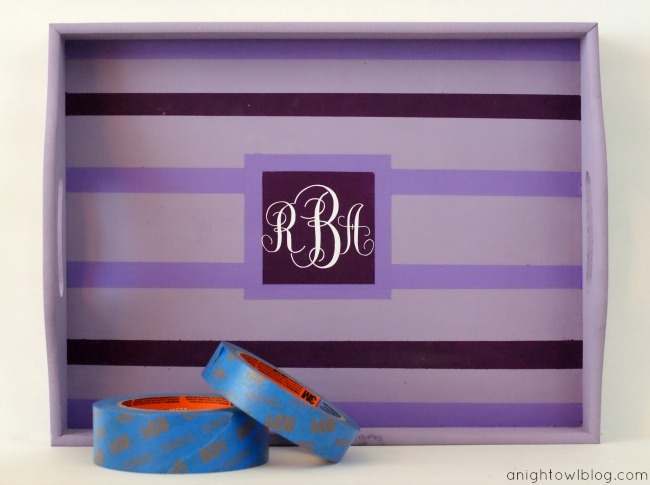 Mother’s Day is right around the corner, and if you’re still looking for something thoughtful and handmade to make, you have plenty of time to create this DIY Monogrammed Tray made with ScotchBlue™ Painter’s Tape. 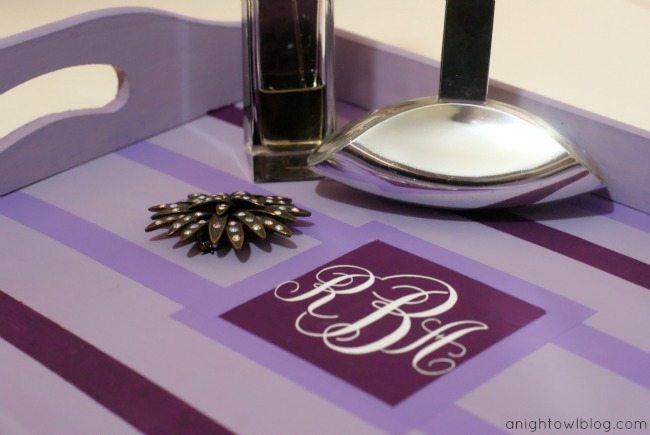 I simply adore all things monogrammed. I think it can take an everyday item and make it personal and special. And isn’t that what you want to convey for Mother’s Day? I also love the patterned trays that you see trending out there, but I knew I could make a beautiful tray for much less! As an avid DIY and Crafter, there are certain supplies that you must keep on hand, and a good quality painter’s tape is one of them! 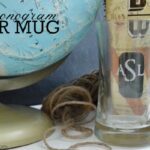 I have always used and have been so pleased with ScotchBlue™ Painter’s Tape, and using it for this project was no exception! So let’s get down to how this project came together and how you can make your very own! And you’re done! A simple but elegant project don’t you think? I love the clean lines that the ScotchBlue™ Painter’s Tape added to the project. And now that the project is done, it can be given to your mother to use for whatever she pleases! 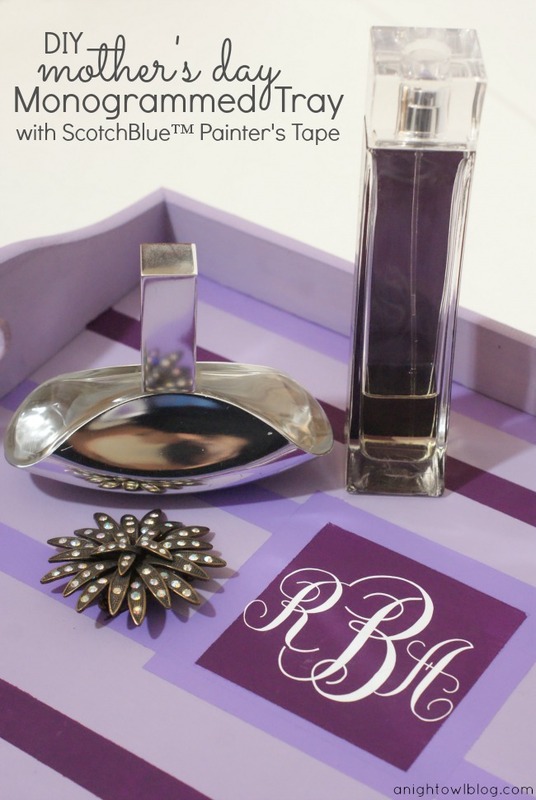 Wouldn’t it make a perfect nightstand tray for jewelry or perfumes? All in all I really enjoyed making the tray and am so pleased with how it turned out! I really hope you’ll give it a try as well! 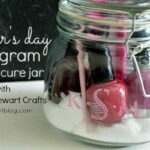 There’s still time before Mother’s Day, or even create one for yourself! 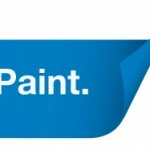 If you do, make sure you use ScotchBlue™ Painter’s Tape! It really is the only painter’s tape that I use and trust to give me quality results! Happy creating! This project turned out so pretty! What a great project!! I’m mad for monograms so you know I love it!!! 😀 And you are totally inspiring me of all I can do with Painter’s Tape!!! Who knew?!?!?!! That is super cute! I love the colors you chose too. Hi Kimberly 🙂 What a fun DIY for Mother’s Day. That painters tape is such a life saver for making straight, pretty lines. 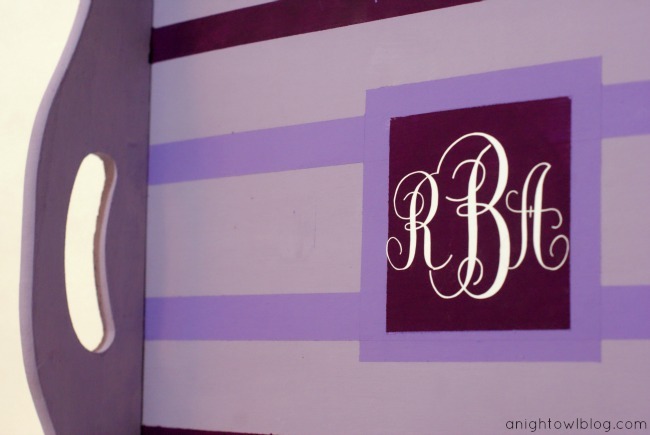 I really love the shades of purple with the monogram initials in the center. Thanks for sharing such a fun idea. What a fun and awesome project! love how the stripes & monogram turned out. I’m a sucker for stripes! Oh wow, Kimberly! This turned out SO adorable. I love it! Love it!! So cute!! What a great gift idea and so pretty!! Thanks for the great idea!! 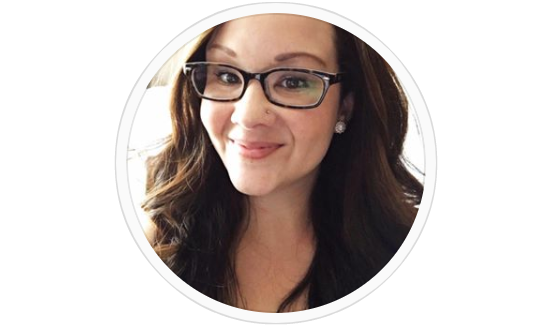 Such a pretty project – and great tips! Thanks! This is such a great way to transform a breakfast tray. 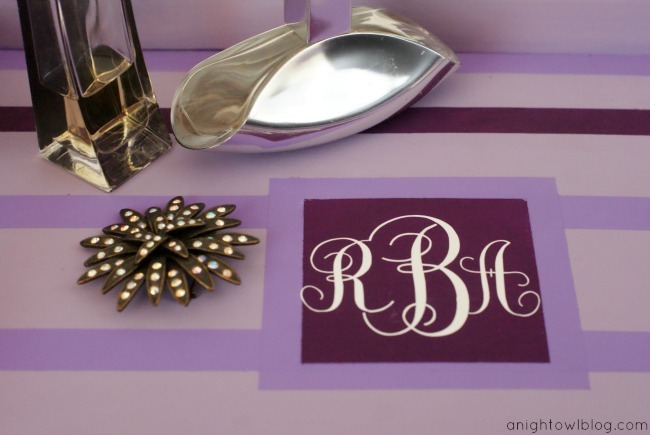 LOVE the monogram! 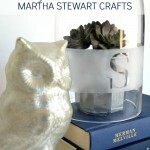 Thanks again for linking up today for Craft With What You’ve Got!